No stranger to working in a range of exciting environments, one recent project saw the Pro Coatings Solutions team called in to help the ITV Studios in Manchester. 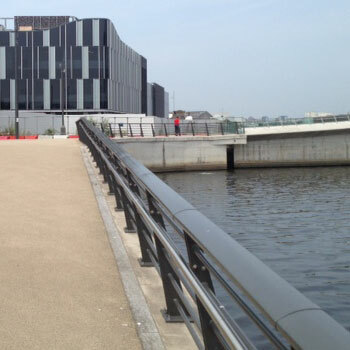 During installation, the balustrade that lined the riverside of the studios had become damaged. Several posts needed respraying and the work had to be carried out incredibly quickly, to an exceptional quality. The client also specified a wish that the work be carried out with minimal disruption to the surrounding studios. ITV Studios contacted Pro Coatings Solutions because of our industry-renowned reputation for providing competitive high quality coating solutions, fast. The most important aspect of the installation was that it needed to be carried out in a short space of time, and to a high quality. That’s why we were chosen to help: our on-site services are some of the most efficient in the UK. With an almost unrivalled knowledge of the techniques, materials and skills required to achieve a high quality finish, Pro Coatings Solutions were pleased to be able to offer our services to the studios. Thanks to our highly skilled painting team and our diligent focus on taking care with our work, we were able to repair the balustrades in under a day, exceeding the clients specifications. We used the latest colour technology and techniques to ensure that a complete colour match was found incredibly quickly. This high quality finish will protect the balustrades and keep them looking attractive for years to come. Our team even managed a quick sightseeing trip down Coronation Street after the project was finished! All in a day’s hard work!